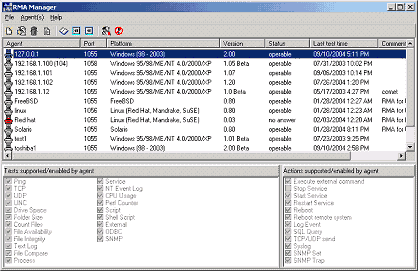 RMA Manager is an auxiliary application for HostMonitor. It is included into Advanced Host Monitor package. Enterprise license for Advanced Host Monitor already includes a license for RMA Manager. Holders of a Lite, Standard or Professional licenses may buy an additional license for RMA Manager separately. and even upgrade agent's code remotely. RMA Manager splits Passive RMA and Active RMA between 2 lists on the screen. However information about all agents stored in the same file (agents.lst). Passive RMA is small application that accepts requests from HostMonitor, performs test (or action) and provides information about test result back to HostMonitor. communication timeout in seconds. A maximum amount of time that RMA Manager or HostMonitor will wait for an answer from the agent. Please note: this timeout should be big enough to allow an agent to perform a test before sending an answer to HostMonitor. When, for example, you are launching an external test and an external program needs 15 seconds to perform this test then the timeout should be set to 15 seconds plus an amount of time that is necessary for data exchange between HostMonitor and an agent. here you should provide the same password that you have specified when an agent was installed and configured on a remote system. After you have finished entering the above information click "Test/Get info" button to check the settings of an agent or click "Ok" button to check the settings and close dialog. RMA Manager will try to establish connection with an agent and get information about agent: platform, version, comment, etc. Also RMA returns information regarding system where it is running on: hostname, Windows version, Service Pack, etc. If connection with an agent was established, RMA Manager updates all agent information and sets status of the agent to "operable". If RMA Manager was not able to get proper information from an agent, it sets its` status to "no answer" (if no answer from agent received) or "bad answer" (if some error code was received from an agent, e.g. wrong password). Active RMA - Remote Monitoring Agent that is not waiting for TCP connection from HostMonitor like Passive RMA. Active RMA itself establishes connection with HostMonitor and RMA Manager. This allows you to install RMA inside private network protected by firewall without necessity to open any TCP port (Passive RMA requires 1 open TCP port). Also Active RMA allows you to monitor system that does not have fixed IP address, e.g. system that is connecting to the network using temporary dial-up connection. minimum six character length password. An empty password using is not permitted. The password is required for every communication session between RMA and HostMonitor or RMA and RMA Manager. All traffic between RMA and HostMonitor or RMA and RMA Manager is encrypted and the password itself is never transmitted through the network without encryption. Note: you should use exactly the same name and password that were used when you setup Active RMA on remote system using rma_cfg utility. Note #1 (RMA Manager): The manager cannot connect to Active RMA due to nature of the agent. If "Accept Active RMA on TCP port #5057" option is enabled, RMA Manager waits for incoming connection from the agent. This option located beside Active RMA list; you may easily change TCP port utilized by the manager but you should remember that RMA should be reconfigured as well. Note #2 (Active RMA): If "Allow remote management" option is enabled, RMA tries to connect to RMA Manager every 30 sec. If appropriate RMA Manager's record for the agent is not created yet, RMA Manager will reject such connections; once connection is established it will be kept until you close it forcedly. If "Allow remote management" option is disabled, RMA will not work with RMA Manager at all. If connection with an Active RMA was established, RMA Manager updates agent information and sets status of the agent to "connected". If RMA Manager was not able to get any information from an agent, it sets its' status to "no answer". If TCP connection request was received but some error occurred (e.g. wrong password), RMA Manager sets "bad answer" status. If communication session was established correctly and then RMA has been disconnected, the manager sets status to "operable". 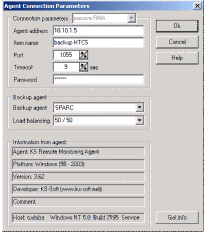 In this case, HostMonitor will request the main agent to perform the tests and will switch to backup agent only in the case of the primary agent not responding. With this option selected, HostMonitor will balance requests for service between the agents. Even if you specify a single primary agent for all your tests, some tests will be performed by primary agent and other by backup RMA. If the primary or the backup agent does not respond, tests will be performed by another (paired) RMA. This option available for Passive RMA only. When "Redundant check" mode specified for 2nd (backup) agent, HostMonitor uses selected agent as "backup" agent as well (this means HostMonitor sends request to backup RMA when cannot establish connection with primary agent). Plus HostMonitor sends request to 2nd RMA every time primary RMA returns "bad" test result (e.g. "No answer", "Unknown host", "Bad"). This means test can be performed from 2 different locations and "Bad" status will be used when both checks performed by both agents fail. Yes, you can use "master-dependant" test relations for such checks and for other much more complicated schemes. However new option allows you to simplify setup, you need just 1 test item instead of 2 items. "Primary agent" - the agent that is specified for the test execution. As you may specify different agents for different test items, the same agent can be a "primary" and "backup", depending on the situation. For example, you may use AgentA to perform set of WMI tests and use AgentB to perform SNMP tests. In case of an emergency AgentB may execute WMI tests as well (AgentB is backup agent for AgentA). AgentA may perform SNMP tests in the case of AgentB failing (AgentA is backup agent for AgentB). To change connection parameters for an agent, select it from the list and press Enter (or choose "Edit connection parameters" item in "Agents" menu). An "Agent Connection Parameters" dialog will pop up, there you may setup connection parameters (agent address, port, timeout, password, etc) like it was already described in previous abstract ("How to add new agent to the list"). When you create a new agent record in the list, RMA Manager tries to connect to a specified agent and gets information from it. However you can refresh/reload this information at any time. Just select a set of agents (or select just one record), and choose "Refresh info" item from the menu "Agent(s)" or press CTRL + I. Comment: the content of a comment field that you or system administrator had provided when a remote agent was installed and configured. Host: information regarding system where the agent is running on: hostname, Windows version, Service Pack, etc. If a connection with agent was established, RMA Manager updates all information and sets the status of an agent to "operable". If RMA Manager was not able to get information from an agent, it sets the status to "no answer" (if no answer from an agent was received) or "bad answer" (if some error code was received from an agent, e.g. wrong password). - "Connected" status is used for Active RMA only. It inticates that agent is connected to RMA Manager. - See also: Note #1 and Note #2. You may reload or terminate an agent on a remote system. It is obvious, that to be able to perform either of these operations an agent should be running and an option "Enable remote management from address" should be enabled. An IP address specified in "Enable remote management from address" of that agent should match the address of the system where you are currently working with RMA Manager. To reload/terminate agent(s), select a group of agents (or just one agent) in the list and click "Reload agent"/"Terminate agent" button on the tool bar (or use similar item from the menu "Agents"). First: to upgrade an agent you need at least to have a newer version of agents` software. Second: an agent of older version should be already running on the remote system. Third (b): If you want to update Active RMA, "Allow remote management" parameter of the agent configuration must be enabled and agent should be connected to the manager (this process may take some time, see Note #2). So, to upgrade agent(s), select a group of agent items in the list and click "Upgrade agent" button on the tool bar (or use similar item from menu "Agents"). The dialog will prompt you to select the file with newer version of agents` software code. After this RMA Manager will send this file to all selected agents. Agents then will write that file to the hard drives of their remote systems and restart themselves. After the completion of this operation an agent with a new code will run on each of the remote systems. Similarly you may upgrade the configuration utility (rma_cfg.exe) on the set of remote systems*. The only difference is in using the menu item "Upgrade configuration utility" instead of "Upgrade agent" and selecting new version of "rma_cfg" utility for upgrade. You may change settings of many agents at one time. Obviously those agents should be running. An agents` setting "Enable remote management from an address" should be enabled and an IP address specified there should point to the machine where you are currently working with RMA Manager. This is an additional measure that together with password protection and encryption of all communications between RMA Manager and an agent provides extra security. here you may specify a comment (actually you may type any text here, it could be a simple recognizable name or an identifier for this agent). This helps to identify agents easier. After you have made changes to the settings above, you may refine the list of agents that will accept these settings (an "Apply to" list). By default this list contains all those agents that were selected before you have pressed the "Agent configuration" button. You may remove or add new agents from/to the list. After you click "Apply" button the new settings will be sent to the agents. You may click "Cancel" button if you have changed your mind. Note: We recommend you to start RMA Manager on the same system where HostMonitor is running. 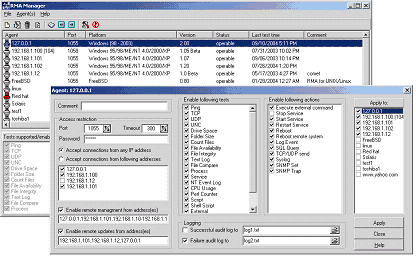 In this case RMA Manager sends message to HostMonitor that, in turn, tells all connected Active RMA to establish connection with RMA Manager (if "Full management" option is enabled for the agent). Otherwise Active RMA will connect to RMA Manager within 30 sec time frame. Also, if you start RMA Manager on system where Advanced Host Monitor package is not installed, you will need to synchronize agents.lst files manually (copy modified file into the folder where HostMonitor is installed). The list of agents may be exported into CSV file (menu "File" -> "Export..."). After some modifications that file may be then imported back again into RMA Manager (menu "File" -> "Import..."). Import Passive RMA list from CSV (comma-separated value) file. The file should begin with header line "Address,Name,Port,Timeout,Password,BackupAgent,BalanceMode"; the following lines contain information about the agents (1 agent per line). Import Active RMA list from CSV (comma-separated value) file. The file should begin with header line "Name,Password,Timeout,KeepConnection,BackupAgent,BalanceMode"; the following lines contain information about the agents (1 agent per line). Note: Timeout and KeepConnection parameters are not used in current version however we recommend you to set these fields to "10000" and "yes" accordingly. When you purchase an Advanced Host Monitor ENTERPRISE edition you will get the license for RMA Manager at no cost. Otherwise the license costs $90 USD. You can order RMA Manager using credit card, Switch and Solo debit cards, check/money order or wire transfer. If you are concerned about submitting your order and/or credit card information online, you may register the RMA Manager via phone, fax or postal mail.